BEVERLY HILLS, Calif. Hollywood's junior prom for film honors features quite a different cast than the senior prom at next month's Academy Awards. Sunday night's Golden Globes are in a rare place this season, coming after the Oscar nominations, which were announced earlier than usual and threw out some shockers that have left the Globes show a little less relevant. Key Globe contenders lined up largely as expected, with Steven Spielberg's Civil War saga "Lincoln" leading with seven nominations and two CIA thrillers — Kathryn Bigelow's "Zero Dark Thirty" and Ben Affleck's "Argo" — also doing well. All three films earned Globe nominations for best drama and director. Yet while "Lincoln," "Argo" and "Zero Dark Thirty" grabbed best-picture slots at Thursday's Oscar nominations, Bigelow and Affleck were snubbed for directing honors after a season that had seen them in the running for almost every other major award. The Globe and Oscar directing fields typically match up closely. This time, though, only Spielberg and "Life of Pi" director Ang Lee have nominations for both. 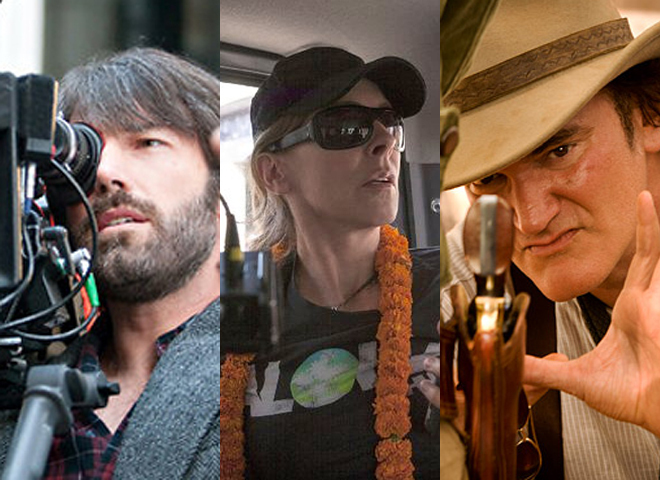 Along with Spielberg, Lee, Bigelow and Affleck, Quentin Tarantino is nominated for directing at the Globes. At the Oscars, it's Spielberg, Lee, "Silver Linings Playbook" director David O. Russell and two surprise picks: veteran Austrian filmmaker Michael Haneke for "Amour" and first-time director Benh Zeitlin for "Beasts of the Southern Wild." That forces some top-name filmmakers to put on brave faces for the Globes. And while a Globe might be a nice consolation prize, it could be a little awkward if Affleck, Bigelow or Tarantino won Sunday and had to make a cheery acceptance speech knowing they don't have seats at the grown-ups table for the Feb. 24 Oscars. That could happen. While "Lincoln" has the most nominations, it's a purely American story that may not have as much appeal to Globe voters — about 90 reporters belonging to the Hollywood Foreign Press Association who cover entertainment for overseas outlets. The Bigelow and Affleck films center on Americans, too, but they are international tales — "Zero Dark Thirty" chronicling the manhunt for Osama bin Laden and "Argo" recounting the rescue of six U.S. embassy workers trapped in Iran amid the 1979 hostage crisis. Globe voters might want to make right on a snub to Bigelow three years ago, when they gave their best-drama and directing prize to ex-husband James Cameron's sci-fi blockbuster "Avatar" over her Iraq war tale "The Hurt Locker." Bigelow made history a month later, becoming the first woman to win the directing Oscar for "The Hurt Locker," which also won best picture. Globe voters like to be trend-setters, but they missed the boat on that one. Might they feel enough chagrin to hand Bigelow the directing trophy this time? Spielberg already has won two best-director Globes, so that might be a further inducement for the foreign-press members to favor someone else this time. Their votes were locked in before the Oscar nominations came out. Globe balloting closed Wednesday, the day before the Academy of Motion Picture Arts and Sciences announced its awards lineup. The Globes feature two best-picture categories — one for drama and one for musical or comedy. Most of the Globe contenders also earned Oscar best-picture nominations, including all of the drama picks: "Argo," "Lincoln," "Life of Pi," "Django Unchained" and "Zero Dark Thirty." Yet only two of the Globe musical or comedy nominees — "Les Miserables" and "Silver Linings Playbook" — are in the running at the Oscars. That's not unusual, though, since Oscar voters tend to overlook comedy. The other Globe nominees for musical or comedy are "The Best Exotic Marigold Hotel," `'Moonrise Kingdom" and "Salmon Fishing in the Yemen." Acting contenders include Daniel Day-Lewis, Sally Field and Tommy Lee Jones for "Lincoln"; Hugh Jackman and Anne Hathaway for "Les Miserables"; Joaquin Phoenix, Amy Adams and Philip Seymour Hoffman for "The Master"; Bradley Cooper and Jennifer Lawrence for "Silver Linings Playbook"; Leonardo DiCaprio and Christoph Waltz for "Django Unchained"; Alan Arkin for "Argo"; and Jessica Chastain for "Zero Dark Thirty." Globe acting recipients usually are a good sneak peek for who will win at the Oscars. All four of last season's Oscar winners — Meryl Streep for "The Iron Lady," Jean Dujardin for "The Artist," Octavia Spencer for "The Help" and Christopher Plummer for "Beginners" — took home a Globe first. Jodie Foster will receive the Globes' Cecil B. DeMille Award for lifetime achievement at the 70th Globes ceremony, airing live from 8-11 p.m. EST on NBC. There will be a friendly rivalry between the hosts of the Globe ceremony, Tina Fey and Amy Poehler. The co-stars of the 2008 big-screen comedy "Baby Mama" both are nominated for best actress in a TV comedy or musical series, Fey for "30 Rock" and Poehler for "Parks and Recreation." The Globes present 14 film awards and 11 television prizes.